All Army personnel (previously only Dual Persona) users have to activate the PIV on their CACs (click these 64bit / 32bit links for specific instructions). Previously, only Dual Persona user needed to activate their PIV to be able to access thier r Enterprise Email account(s). The Army is pushing for everyone to expose their PIV now, is to make you ready. You will be able to login to any EAMS-A websites with your ID, PIV, or Email certificate. You will continue to use your Email certificate for Enterprise Email (for most people). Signing PDFs will still only work with ID or Email. The PIV won't show up. NOTE: All Army CACs issued since end of month February 2018 have the PIV already activated. This page is for anyone with a CAC issued prior to EOM February 2018. (Follow these 64bit / 32bit links for instructions). 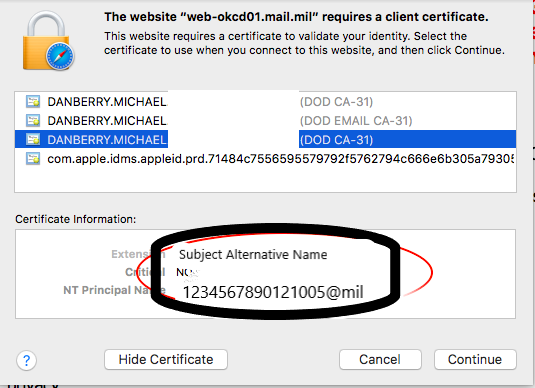 Mac users needing to use their PIV certificate need to select one of the non Email certs and scroll down to verify the NT Principal Name. It will be your 10 digit DoD ID # followed immediately by 6 more digits: 121004 = MIL, 121002 = CIV, 121005 = CTR, or 121001 = NAF. (121xxx is Army, 157xxx is Air Force, 117xxx is Navy, & 11727x is Marines). If you don't see NT Principal Name, select the other non email certificate. If you don't see another option, then you may need to find a Windows computer and reactivate your PIV cert again. Mac Users - The ability to activate your PIV is NOT possible on the Mac OS. You need to find a Windows 7 (or 10) computer (maybe at your unit), or virtualize Windows and then follow the information on this page..
Chrome and Linux Users - The ability to activate your PIV is NOT possible in Chrome or Linux OS. You need to find a Windows 7 (or 10) computer (maybe at your unit), or virtualize Windows and then follow information on this page. Question / Problem: How do I "add" a PIV certificate to my CAC, so, I can access my DoD Enterprise Email, or I'm being directed to do it? Technically, the PIV certificate is already on your CAC but is hidden by default. DMDC classifies some personnel as a "Dual Persona." If so, you need to "expose" it. (Dual Persona is an Army Reserve [or Guard] Soldier who is [or has ever also been] a DoD civilian [or contractor] therefore authorized to carry two CACs at the same time). Some people who were previously a contractor [or civilian] in the past [even if you left the job] and are still classified as dual persona. This may be a reason why you cannot access your webmail. If you want to verify this first, call the Army Enterprise Service Desk (866-335-2769) and have them check your status in DEPO. --You cannot use the same email address on both cards. See error message. Here's how to change your email address on your CAC. This can also be used to add an email address to your CAC if you don't already have an email address on it. PIV Activation Step 4- In Internet Explorer 11, Select Enable 64-bit processes for Enhanced Protected Mode* [in Internet Options, Advanced Tab] to run IE in 64 bit mode. By default, IE 11 runs in 32 bit mode. More information can be read here. Immediately after your PIV is activated, remove your CAC from the reader, then reinsert it. You "should" now see 4 certificates when looking in Internet Explorer, Tools, Internet Options, Content (tab), certificates (button), Personal (tab). Non-Solution for Mac Users: I have not found any way for you to activate your PIV using a Mac. The recommended method is to find a Windows 10 or 7 computer and follow Instructions above. Solution 2: DMDCs Self Service website is working better now than it did originally for activating users PIV authentication certificate. This affects every person who hold the dual persona role(s). You can manually configure ActivClient to expose your PIV cert on your computer (Windows 7 with ActivClient 6.2.0.x installed). This will have to be done on every computer you need to access your mail.mil email on. This solution negates the issue with DMDCs Self Service website to expose your certificate. NOTE: If you use WAWF, DO NOT do this, you must activate your PIV above. -After you have installed the latest update, open ActivClient, Click Tools, Advanced, Configuration (requires elevated access on Government systems), scroll down [and click on] Smart Card, click line titled: Prefer GSC-IS over PIV EndPoint... change the Yes to a No. -You will be prompted to restart the computer. After the restart every time you go to https://web.mail.mil, you'll have to select the certificate that says PIV, (NOT the Email certificate). Government computer users will need to make sure they select the 10 digit certificate to login to the computer, and 16 digit to check your email. If you select the 16 digit during login, you will get DoD visitor, or Credentials cannot be verified error message. --ActivClient update version of 7.0.2.308 and above show your PIV automatically. WAWF (Wide Area Work Flow) users: When the Wide Area Workflow website updated and moved to CAC / certificate only logon, a Dual-Persona user who has the ActivClient setting changed will find out the WAWF website will not correctly read their DoD x.509 certificate and will therefore receive a 'No Certificates Found!' message. If you are a Dual Persona and need to access both Enterprise Email and WAWF, you MUST undo the ActivClient setting (change back to YES) and activate your PIV certificate via the RAPIDS Self Service website. After that, the WAWF website will correctly read your certificates and allow you to register your CAC. Question: What exactly is "Dual Persona?" Answer: The easiest way to explain is to give you an example: an Army Reserve [or Guard] Soldier who is also a DoD civilian [or contractor] who is authorized [or required] to have / carry / use two separate CACs. We have found people who were previously a contractor [or civilian] during the past three to five years [even if they left the job a year ago] are still classified as a Dual Persona in the eyes of DMDC and DISA. Individuals that fall into this category HAVE to activate their PIV certificate to be able to access their email in the DoD Enterprise Email. If you want to validate this prior to going through this process. Call the Army Enterprise Service Desk-Worldwide at 866-335-2769 and select Enterprise Email. Ask the agent to look in DEPO to verify if you are PIV AUTH. Question: What do I do if I add PCC to UPN on my CAC, resulting in a .letter after my DoD ID number? This renders the certificate useless for Army personnel. Evidently, the Air Force uses this. NOTE: Java 7 update 71 was the last version that had the ability to slide the Security bar to Medium. This is needed for the DMDC Self Service (PIV activation) site to work, read more here. You can update to the current version of Java once you activate your PIV cert.